Please consult the photograph above for details of the product’s packaging, design and retail presentation. One (1) additional image of the recalled Children’s Toys can be found on the Web site above. 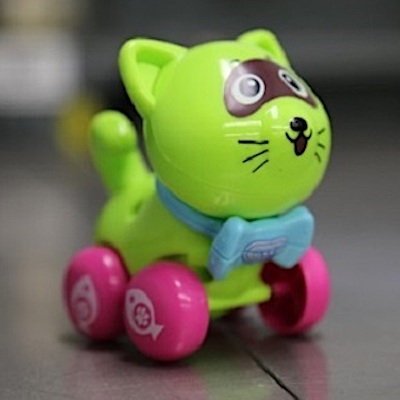 According to Health Canada, its sampling and evaluation program has determined that the recalled Toys do not meet the Canadian safety requirements for children’s toys. Specifically, the tail of the Racoon Toy can detach from the main body, posing choking and ingestion hazards to young children. If you believe you have purchased or have in your possession any of the recalled Wind-up Toy Raccoons, please do not use them nor let your child play with or near them. Instead, kindly contact Brin de Folie for a full refund. If you have any questions about this recall notification, please contact Brin de Folie at 1-418-692-2219, during normal business hours, Eastern Standard Time, Monday to Sunday. ==> To see other recalls and notifications caused by suspected faulty and/or dangerous Children’s Toys, please search for “toy” using the Search Box at the top of this page. ==> To see other recalls and notifications caused by Choking hazard, please search for “choking” using the Search Box at the top of this page. ==> To see other recalls and notifications caused by Ingestion hazard, please search for “ingestion” using the Search Box at the top of this page. ==> To see other recalls and notifications for products manufactured, marketed and/or sold by Brin de Folie, please search for “Brin de Folie” using the Search Box at the top of this page.